It seemed that when drinking iced beverages, ice would melt faster in a glass of water than in brandy. This led us to question if ice actually melts faster in water or brandy. Uncontrolled observation suggested that ice would disappear quite quickly in a glass of water compared to a glass of brandy, so that is the starting expectation. The timelapse video is 30 frames per second, 23 seconds long, and represents 1 frame acquired every 8 seconds. The video runs between actual (clock) times of ~9:20 – 11pm. For a description of how timelapse on iOS 8 works, please see here. Temperature curves for brandy and water with ice. 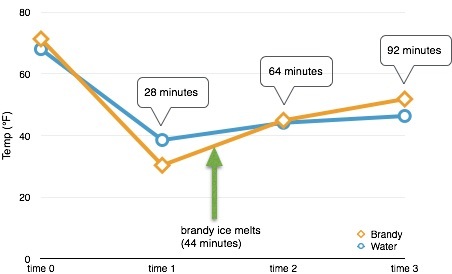 Despite what casual observation indicated, ice melts significantly faster in brandy than in water. From a chemical standpoint this makes sense. What is brandy but water with stuff (solutes) in it? Solutes in water disrupt ice formation and encourage melting. See here for an interactive demo. We happen to use salt on the roads and walkways in areas that have snowy winter climates because it is abundant and cheap, but sugar and alcohol work the same way… it would just be very expensive, and possibly a bit sticky later, to hose everything down with brandy. While the water did start at a colder temperature and have slightly more ice due to variations in ice cube mass, the brandy reached a lower temperature as part of the cooling curve, so it is considered doubtful that these initial variations impacted the outcome. It is suspected that the initial observation was based on the fact that we never pour ourselves 3 oz of water. Typically, a glass of water in our household is somewhere between 15-28 oz. How would varying the proof of alcohol impact ice melting rates? Would working with a typical serving of water vs a typical pour of brandy match the previously observed behavior (in which case, how much more water is needed than brandy to have equal melting rates)? Provost, Dan. Sept 23, 2014. “How Does the iOS 8 Time-lapse Feature Work?”. Studio Neat. <http://www.studioneat.com/blogs/main/15467765-how-does-the-ios-8-time-lapse-feature-work> accessed Nov 16, 2014.